The biennial Glasgow International festival started this weekend in the city, a festival of contemporary art. Running alongside it this weekend was Counterflows, a weekend of contemporary and experimental music performances. Lots of copies of The Wire magazine were rolled up into the shoulder bags of chin-stroking, bearded men as they headed out to this over the weekend. In fact, contrary to this stereotype, it was nice to see a good mixture of people in the audience and on stage, with the prominence of women in the forefront of the experimental music scene obvious from the start. It kicked off on Friday night in the Garnethill Multicultural Centre with The Space Lady. Not someone I'd heard of before but this isn't surprising as she hasn't played in Europe until now, usually being found over the past 30 years busking for hours either in Boston or San Francisco with her Casio organ. I was ready to be a bit cynical by a middle aged woman at a Casio organ wearing a plastic winged helmet with a flashing red light atop it. However within one song I was won over by her gentle singing and mastery of the full range of Casio special effects. A one off, and a good opening act. 48 hours later she'd be playing a set in Queens Park. Ai Aso is a Japanese singer and songwriter and purveyor of floaty, folky, psychedelic pop music who I'd been looking forward to seeing after hearing her album 'Lone'. However she was so floaty and quiet at times that we were craning to hear when songs ended, whilst the bar staff risked drowning her out it they opened a beer for anyone. In one song she had men rushing into their shoulder bags for their ear plugs as she whispered alongside raucous guitar feedback. If Death Metal has a polar opposite we were witnessing it. Ela Orleans is someone I am more familiar with, most recently when she supported Julia Holter in Glasgow. Originally from Poland, the Glasgow based musician, describes her output as "movies for ears". Her recently re-issued album Tumult In The Clouds is worth seeking out (here). Tonight she was playing with Maja Borg, Swedish artist and filmmaker. Ela Orleans created the roundest sound of the first part of the evening, excellent as ever, with visuals provided by Maya Borg, who finished the set off with a spoken word piece over one of her films. Next we trailed across the road to the intriguing venue of the underground car park below Fleming House. This has been commandeered by Glasgow International as an exhibition space, dressed up as a swimming pool. Tonight it was a perfect venue for two Japanese musicians/ sound artists - Aki Onda and Akio Suzuki. Akio Suzuki played field recordings from a train station on a Sony Walkman and manipulated the sound whilst the older of the two (Akio Suzuki) went for a more physical approach, dropping nails into a metal bucket, hammering them into a plank of wood, then playing the percussion instrument he'd created. There were a lot of echoes of Marginal Consort's Glasgow gig from 2008 in the entertaining mix of music and performance which fitted the venue perfectly. Next up was a short stroll around to the CCA (Centre for Contemporary Arts) for the next course. Luke Fowler is an artist who works in Glasgow with film and sound and he has worked alongside Richard Youngs when I've seen him before. Tonight he was performing with Finnish industrial/ electronic musician Mika Vainio (whose album Fe₃O₄ - Magnetite I picked up once at random as I liked the title) and Lee Patterson, who has a history of amplifying sound from objects as diverse as Epsom salts and burning peanuts. The three silent men hunched over their respective electrical boxes of tricks in the darkened room were quite captivating. Ranging from violent drones to quiet electronic clicks they finished grandly with the highly amplified clicks and pops of a small conflagration Lee Patterson got going on his table. (60 second snippet below). At a suitably late hour Joe McPhee took centre stage, one of the main attractions of the festival weekend. He was back on stage several times over the weekend, blowing the roof off in the closing concert on Sunday night. I didn't manage to take in all of the delights on offer on Saturday 5th April as there was the small matter of me wanting to enjoy the visit of Heart of Midlothian Football Club to Maryhill that afternoon. However I think the shockingly bad performance of Partick Thistle maybe made me less receptive than I might have been to the evening performances at the CCA. The programme was less varied than elsewhere in the festival with four duets all striking a similar tone. Sound poetry, sqwaking and screeching has always left me cold, so Cara Tolmie dancing about in the darkened room shouting "Ah, aaah, ooh, ooh, eeh" was never really going to be my thing, entertaining as it was for a few minutes. Paul Abbot's unaccompanied drumming was absolutely riveting. Controlled and aggressive. The latter half of the performance with him lying inside the bass drum reading gibberish whilst Cara dismantled the drum kit felt a bit of an anti-climax. The performance was impressive but the words felt meaningless. Australian drummer Will Guthrie and Portugal's David Maranha were up next. Their first piece had Maranha playing keyboard as electric guitar complete with lots of feedback, accompanied by crescendo-ing drums. Their second piece had more interesting texture. They were met with polite, rather than uproarious applause. Ghedalia Tazartes and Maya Dunietz received a warmer reception. Unlike the earlier shouts of Cara Tolmie, their chanting and singing had a much more evocative, captivating feel. Backed by an electronic soundtrack, drones and their own combination of prayer bells, whistles, mouth organs and chimes it brought to mind religious chants and funereal ululations. Maya Dunietz was back on the last night at the Glad Cafe introducing us to the music of Emahoy Maryam Guebrou, an Ethiopian nun, composer and pianist. John Butcher on saxophone with Mark Sanders were up last but their piece "Tarab Cuts" felt like a work in progress. Sunday night's finale at the Glad Cafe was a tour de force. Joachim Roedelius and Stefan Schneider performed on acoustic piano, accompanied by various electronic clicks, hisses and manipulation to great effect, the gentle piano playing contrasting sharply with the accompaniment. 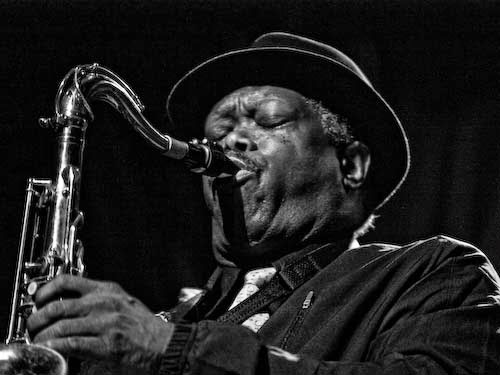 Joe McPhee, the 75 year old American composer, musician, improviser and free jazz multi-instrumentalist gave a barn-storming performance to bring things to a close. I have never been a great jazz aficionado, working my way through some of the classics and enduring jazz bands in the Three Judges of an occasional Sunday afternoon. However if more jazz sounded like the Joe McPhee trio I'd have been paying it more attention. As well as the man himself out front on saxophone, Steve Noble on drums and John Edwards on double bass brought sounds out of their instruments that I've never heard before. An absolutely mesmerising performance. Next onstage was Swedish saxophonist and improviser Mats Gustaffson playing as a duet with McPhee. His was again a gripping performance, quieter and at times enjoyably odd. His saxophone, come trombone, come swanee whistle was a sight to behold, as was his masterclass in circular breathing. Next up he brought out a large bass saxophone to play against Joe McPhee in the style of a ship's foghorn, before the evening came to a close with a bigger ensemble. It was a well put together festival of some high quality and diverse musicians. Credit is due to all those who organised it and kept things running smoothly through some busy line-ups. It was also good to see such healthy crowds coming to hear this stuff and maybe promoters should notice that there is a bigger audience out there for this music than they maybe realise.